An Assistant Professor in Clinical Psychology, Dr. Naif is a member of the academic staff at Kuwait University’s Faculty of Medicine, where he has been teaching clinical psychology, communication skills creative writing, and cognitive behavioral therapy since 2005. Dr. Naif has a PhD in Clinical Psychology from Long Island University where he also earned a Master’s Degree in Clinical Psychology. He holds a Masters in Organizational Psychology from Teacher’s College, Columbia University and an MBA, also from Columbia University. He holds a certification in conflict resolution from the University. He earned his undergraduate degree from Tufts University, where he triple majored in clinical psychology, English literature and history. Dr. Naif has extensive clinical experience working with former prisoners of war in Kuwait and the Survivors of Political Torture unit of Bellevue Hospital in New York. He has seen first-hand the cancer that intolerance can bring to any society. His direct contact with the horrors of people tortured because of their religious and political beliefs, led to his writing a timeless children’s tale that won a UNESCO prize for literature in the service of tolerance. A serial entrepreneur, Dr. Naif Al-Mutawa is the creator of THE 99, the first group of comic superheroes born of an Islamic archetype. THE 99 has received positive attention from the world’s media. Forbes named THE 99 as one of the top 20 trends sweeping the globe and President Barack Obama praised Dr. Naif and THE 99 as perhaps the most innovative of the thousands of new entrepreneurs viewed by his Presidential Summit on Entrepreneurship. 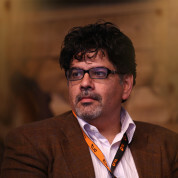 A highly acclaimed keynote speaker in topics ranging from mental health to entrepreneurship, Dr. Naif conducts regular workshops in creative problem solving, attention management, stress management, conflict resolution, and anger management and has been sought after by private companies and governments alike to train their employees. He is on the investment committee of Kuwait’s National Fund for Small and Medium Sized Businesses, a fund of $7 billion dollars is earmarked to promote entrepreneurship in Kuwait. He is also a board member of Future Kids, a publicly listed company on the Kuwait Stock Exchange and a board member of Al-Jazeera Entertainment.